Bath and candle gift baskets are lovely, luxurious gifts for many occasions. There are many types of baskets to choose from, and do-it-yourselfers can even create their own gift baskets to personalize for someone special. A bath and candle spa basket can also be a perfect anytime gift to help anyone relax at a stressful time of life, such as during a divorce, after moving, or upon seeking a new job. They are also popular as holiday candle gifts. Spa gift baskets come in a variety of sizes and scents. Some companies offer different customization options or may be willing to create completely unique baskets. The two biggest ways to customize bath and candle gift baskets, however, is by scent and the items included in the gift. If the desired scent is not available, it is easy to create a specialized gift basket using creative scented candles and popular bath items, or a basic spa basket could have a favorite scented candle added to it for extra indulgence. The number and type of items depends on the company, the size of the basket, and the overall cost. 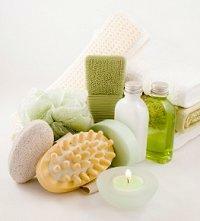 Specialty gift companies often create spa themed gift baskets. While some day spas may offer baskets of their popular products for sale, online retailers generally have a larger selection. 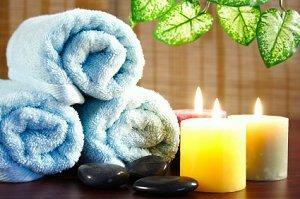 The cost of a spa gift basket can range from $40 to more than $200 depending on its size and what is included. Handmade and organic products generally command a higher price, as do more exotic scents and elaborate baskets. If you can't find the perfect bath and candle gift, it is easy to make a gift basket from scratch. Choose the basket. Wicker baskets are the most popular, but other options include beach totes, photo memory boxes, or keepsake tins. Choose the theme. A theme may be tied to the gift-giving occasion such as a wedding gift basket for a bride-to-be, or it may be as simple as choosing a favorite scent or color to coordinate the basket. Select items for the basket. Choose a range of items for a thorough pampering experience and opt for small travel-size bottles and packages to create an intimate gift. Be sure to consider the recipient's personal preferences, allergies, and style when choosing items to give. Consider opting for more expensive, indulgent items in smaller sizes rather than focusing on larger quantities. Arrange items in the basket. A towel can be used to line the basket, and place larger, bulkier items in first. Use small, attractive items such as decorative soaps or colorful bath beads as practical accents. Wrap the gift if desired. Most gift baskets are simply wrapped in cellophane or else topped with a bow and no other wrapping. If you do want to wrap the basket, consider using an oversized towel as an additional gift and environmentally-friendly wrapping. A bath gift basket is meant to be enjoyed in a relaxing, pampering way. If possible, help the recipient enjoy the gift by ensuring they are not interrupted in the bath, and clean the bathroom for them before they indulge. Bath and candle gift baskets are a delightful way to help someone special indulge in decadent luxury. From the relaxing scents of an aromatherapy candle to the soft skin treatments of lotions and oils, this type of gift is sure to be well appreciated.